Criminal charges in San Tan Valley, Arizona often carry severe penalties and lasting consequences. Even a low level misdemeanor can result in a permanent criminal conviction that will follow you. If you’re facing any criminal charge in San Tan Valley, it’s a good idea to hire an Arizona criminal defense attorney that regularly defends cases from San Tan Valley. Criminal Defense Attorney Timothy Tobin has practiced criminal law for several years. He provides clients with professional and aggressive criminal defense in the courts serving San Tan Valley. As a former Maricopa County Prosecutor, Mr. Tobin prosecuted cases from San Tan Valley, Gilbert, East Mesa, and Apache Junction. Now defending San Tan Valley cases regularly, Mr. Tobin is familiar and experienced with police, judges, and prosecutors in San Tan Valley cases. If you’re charged with a misdemeanor in San Tan Valley by Maricopa County’s Sheriff’s Office, or the Arizona’s Department of Public Safety, you may be in the San Tan Justice Court, which serves most of San Tan Valley’s Jurisdiction. But if it was Pinal County Sheriff’s Office, there’s a good chance that you’ll be in the Apache Junction Justice Court. 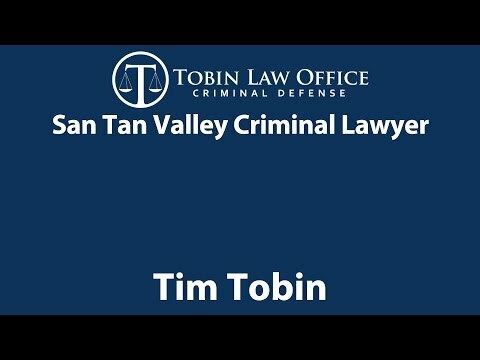 Tobin Law Office Offers Excellent and Knowledgeable Criminal Defense for San Tan Valley Residents and Cases. When facing criminal charges out of San Tan Valley, Arizona, it’s not a good idea to represent yourself. Arizona’s has harsh and complex criminal laws. Representing yourself, you’ll find yourself across a trained prosecutor and unforgiving judge. The government’s main focus is to process cases and secure convictions. There’s little, if any, concern about your personal situation or future. Attorney Tobin will tell you from experience that prosecutors and judges will see you as a number in a long line of cases. When facing charges out of San Tan Valley, it’s important to retain a criminal defense lawyer who’s focused on Arizona criminal law and has experience with the government agencies prosecuting San Tan Valley cases. Transparent Flat Rates and Payment Plans: Defense services at Tobin Law Office are offered at an affordable flat rate. There are no hidden fees or surprises. The total cost is known up front. Former Prosecutor: While a prosecutor for Maricopa County, Attorney Tobin handled cases arising out of San Tan Valley, Gilbert, East Mesa, and Apache Junction. Experienced in San Tan Valley Cases: Practicing in the San Tan Justice Court and Apache Junction Justice Court regularly, Mr. Tobin provides experienced and dedicated criminal defense for San Tan Valley cases. Excellent Communication and Contact: Attorney Tobin handles every aspect of the case when defending his client. There’s no need to go through secretaries, paralegals, or other associates. Every client has Mr. Tobin’s direct cell phone and email for easy access. Free and Confidential Consultations: When you reach out to us, you’ll be put in direct contact with Mr. Tobin to go over your case. Mr. Tobin will answer all your questions to reduce the stress and anxiety you’re likely feeling. Highly Recommend Mr. Tobin To Everyone!